An “Apéro” is basically a chill cocktail party. It is either the “before” to a classic meal, or it can be the full meal (an “apéro dinatoire”). With the party season coming up, we thought a French themed party could be a great way for you to entertain guests. In this series, we will share the staples you will need to host a wonderful French Apéro. We have already covered the drinks and the food in previous articles (if you missed them you can read the drinks article here and the food article here). Today, we will cover the dessert. This is obviously one of the best parts of planning an apéro. It is also one of the main reasons you don’t want to have a huge main course (and rather have little bites here and there): so you can actually have room for dessert, and hopefully a few of them! There are two ways to go: you could either do a full big cake or keep the finger food vibe with mini cakes and pastries. If you choose the big cake road, we would advise you to get 2 to 3 cakes. As not everyone has the same taste and you’ll want to try different cakes this is the best way to do it. However, in order to do that, you want to make sure that you have enough guests. As a cake usually serves 6-8 (but if you have slices of a few different ones, one cake can serve about 12), you want to have at least 10 guests to pull the big cake card. This is also a great option if you are celebrating a birthday (so you can have more space for candles and everyone sharing the same cakes). This is great for your guests to taste many different ones plus, as anything mini, it looks super cute. It is also amazing as you can have a lot of different pastries. You could do a mix of pastries, chocolates and macarons, which would be very versatile and please everyone. If you want a more dramatic and glamorous dessert entrance, pick a macaron tower! Minis are also the option to choose if you are having a dance party during dessert time, or if you don’t have a lot of room for people to put down plates and don’t want to get the spoons out: with minis everyone is able to eat with their hands (and it’s still classy for some reason). 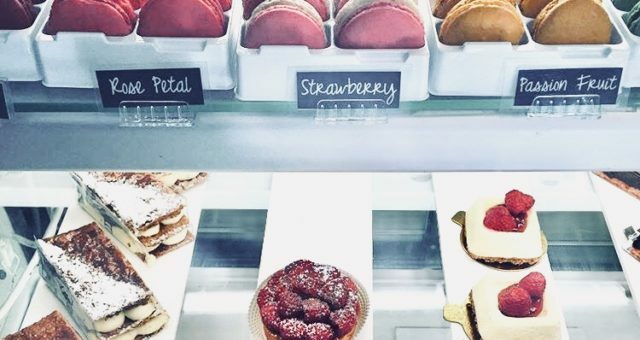 Below, we will share a few of the cakes and pastries that Atelier Monnier offers and which we think would be a perfect fit for a French apéro. 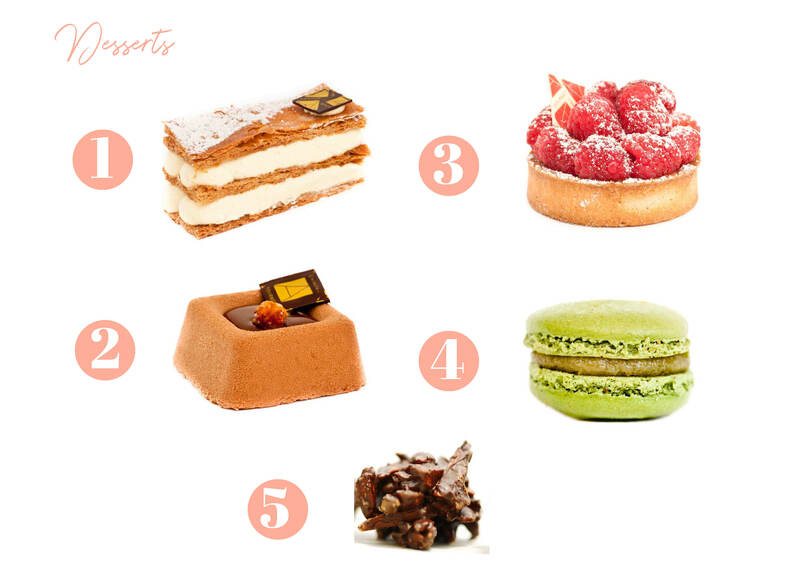 Except for macarons, most cakes come in both big and individual sizes. A classic. If you want the frenchiest vibe, this is definitely the way to go! A great option to have some fruit and freshness added to your dessert assortment. Pick at least one French Carré. You can go classic with a the Carré Three Layer Chocolate (Dark, milk and white chocolate mousse, chocolate almond sponge cake) that will please chocolate lovers, or the more subtle Carré Crunchy (Milk chocolate mousse, praline cream on a praline sponge cake). Macarons are always a hit! You can even customize your selection to match the color code of your party. Or just go with your favorite flavors. It is an option but chocolate are always appreciated, especially if you will be offering coffee at the end of the apéro. You can then get them out after desserts, for guests to enjoy with their coffee (or tea). Hope this article will inspire you for planning your next French Apéro. Don’t hesitate to let us know in the comments what are your tips and tricks to make a cocktail party extra special!